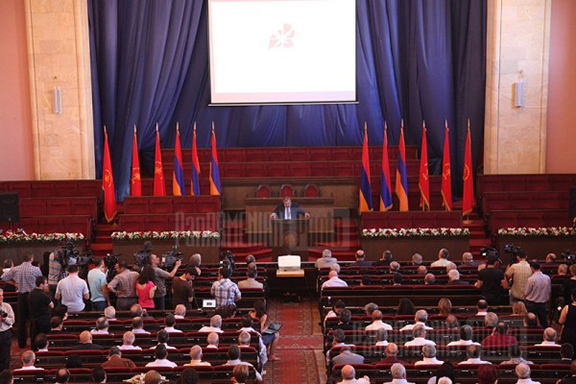 We’re at the onset of a new year, a (cautiously-optimistically) “new Armenia”, and a new (33rd) Armenian Revolutionary Federation World Congress. The date for this quadrennial (roughly) assembly has shifted a couple of times, most recently to mid-January, because of the Republic of Armenia’s (RoA) December 9 snap elections. It could well become one of the turning points in the organization’s more than quasquicentennial history. In case any readers don’t know, I’m a member of the ARF. So, I figured I’d chime in a little bit on what I think ought to be addressed at the big meeting. It will also bring in the English-reading segment of our community since most of these discussions occur in Armenian and the only other item I’m aware of in English on this issue is Haig Kayserian’s “A Renewed ARF Can Help Build Democracy in New Armenia” from a few weeks ago. The particular niche I want to focus on is the party’s image and public relations in the context of how we approach our work, which also ties in to how we perceive ourselves and based on that how we choose to function in the varied settings we find ourselves in. This will not be a discussion of ideology or particular policy prescriptions, rather the WAY by which to implement them. Historically, the ARF has not been very good at “selling” ourselves, relying on the power of our good works to speak for us. Unfortunately, in the world created post-World War II, this is insufficient (watch part one the BBC series, “Century of the Self” if you have any doubt about this). So much has been studied and learned about how people “buy” things and how advertising and marketing affects them that the traditional (to me preferable and more decent) approach of doing the right thing then letting word of mouth coupled with at best a news item or two spread among our constituency just doesn’t work anymore. This is even more true in the ARF’s newest operational setting, the RoA. Over the past quarter century, we have conducted and heard many analyses regarding the support anticipated for ARF candidates fielded in a RoA election. Yet, somehow, the anticipated results never materialize. This is not for lack of preparation and effort, though sometimes the campaigning and electioneering the party has done have seemed to me to be less than maximal compared to some of the efforts made in various countries of the Diaspora. The internally disseminated rationales often seem utterly logical, possibly even flawless, before elections. Yet, the results don’t match anticipations. There is resistance, quite understandably, to basing organizational practices and actions on the consideration of our image in post-Soviet times ON THE GROUND, in the Republic of Armenia. After decades of anti-ARF propaganda and only a vague, quasi-legendary, memory of our productive, people-centered, and state building efforts of a century ago, it comes as no surprise to anyone that the ARF has encountered serious difficulties at making progress re-rooting among the country’s population in the three decades since we “returned” home. Perhaps as a result of this difficulty, our efforts have been heavily focused on the electoral-political arena, in effect pursuing “change from above” rather than the more onerous, time-consuming, and (in light of the afore-mentioned propaganda) far more difficult route that runs through grass-roots organizing. Some progress was made via this approach, but the ARF was significantly handicapped by the absence of sufficient grassroots clout to back up its parliamentary/legislative efforts. Consequently it was tactically “obliged” to form coalitions with the oligarchic administrations to enact desirable legislation or attempt to prevent the passage of bad laws. The best example is probably constitutional reform. It took a quarter century, but finally a parliamentary rather than presidential system was put in place, something the ARF had advocated from the very beginning of the creation of the third Armenian republic. Of course that happened because the Republican Party of Armenia (RPA), and specifically President Serzh Sarkisian, saw it as a means of perpetuating his hold on power after he otherwise would have been term-limited out of office. What no one has noticed is the irony that followed. Had not Sarkissian gone back on his promise not to seek the prime minister position after his presidency, the political moment would likely not have been created for the street movement led by Nigol Pashinyan to take hold. So the much criticized ARF was actually the enabler of the spring 2018 uprising in the RoA. Another consideration is that historically, the ARF has functioned in a defensive (para-military), ideological, quasi-governmental, or revolutionary context, and not an electoral-political one, with the exception of the short lived periods of Ottoman constitutionalism and the first Armenian republic (our electoral work in numerous countries of the Diaspora is very different from being an actual political party in one’s own home country). This factor may well have affected our decisions in subtle and not easily perceptible ways. A third, and this time positive, aspect to consider is made evident through two examples. The ARF consistently does better in Artsakh’s elections than in the RoA. I think that is because the party is much more grassroots there, perforce, stemming from its key role in the early days of the military part of the struggle for Artsakh’s liberation. People naturally know and remember this. The answer to “what have you done for me lately” is obvious. The other example (reported only in Armenian to my knowledge) comes from the December 9 snap elections’ results in Geghamavan. There, Ishkhan Saghatelyan, running on the ARF’s ticket, trounced “My Step” (Nigol Pashinyan’s grouping). Of 884 votes cast, he got 664 to My Step’s 185 and Prosperous Armenia Party’s 11. How did this happen? It was because the people of that community knew and recognized Saghatelian’s and the ARF work and voted for what they knew to be good. This is all grist for the World Congress’s mill. The ARF must contend with the reality of the ongoing impacts of Soviet, foreign power, and some local/current anti-ARF propaganda. It is now paying the electoral political price for cooperation with the (RPA). Proof of electoral success based on grassroots work exists. The reality of people’s behavior (electoral and otherwise) being based on perceptions/image coupled with marketing/advertising/propaganda is undeniable and fiercely real. What should the world Congress do with all this? When formulating resolutions on the path forward, the two guiderails for ANY decision should be the questions: “How will this be perceived in our current reality and how might it be twisted and misrepresented by our opponents?” and “Will people see this as something the ARF is doing for their benefit?” Upon adjournment of the World Congress, work should begin on whatever policies are prioritized for the RoA, but focused where the best (not necessarily quickest) results can be achieved for the people. My guess is this will be outside of Yerevan. In smaller cities, towns, and villages, a more intimate working relationship between party and people can be created. Then, when the good results come in, voting support will follow. Later, the same approach can be implemented in Yerevan, one neighborhood at a time. Especially if, as some have argued, there is a consistent (if not concerted) effort to denigrate the ARF by foreign (and some domestic) interests, then it is all the more important to work at the grass roots level with people. Building trust, one person at a time, can easily blunt, if not totally deflect, that kind of venom directed at the ARF. Let’s go for those grassroots. ARF got majority of the votes in three villages and not just one. In Shenik village, Armavir marz ARF received 80.6% of the votes, which was the highest based on the percentage, Artsvik Minasyan of ARF got 353 votes, My Step 60, and others 19. In Geghamyan village, Gegharkounik marz ARF received 75.4% of votes, Ishkan Saghatelyan of ARF received 664 votes, My Step 182, and others 29. In Tavshoot, Shirak marz ARF received 55.4% of the votes, where Sooren Sargsyan got 88 votes and other ARF candidates 9 votes (total of 97), My Step 55, others 22. In seven other villages ARF received 50% to 35% of total votes but ARF had the highest number of the votes among all the parties in those villages. I am surprised that Asbarez has only mentioned Ishkhan’s numbers.